While tariffs on the steel and agriculture industries have taken center stage in the trade conflict between the U.S. and China, that conflict has quietly moved into another less visible sector. It’s greatly disrupted the recycling industry. The U.S. is coming to the end of a 30-day suspension on all recycling going to China. But China has set some new rules about what can be recycled going forward. Those new policies are already affecting businesses, but over time they could impact residents and city governments and even undermine state environmental policy. Among the warehouses and distribution centers in south Fresno, the calls of egrets, herons and great horned owls may seem a little out of place. But they serve a purpose: This is a transfer station for Mid Valley Disposal, one of the biggest trash and recycling collectors in the San Joaquin Valley, and these recordings of bird calls help keep pests out of scrap materials trucked in each day. Joseph Kalpakoff, president of Mid Valley Disposal, says pest control is especially important now, because his property is filling up fast. He points to a wall of paper bales around 10 feet high. “You’re probably looking at a couple hundred tons of mixed paper in just this part of the parking lot,” he says. Six months ago, it would have been empty. These bales are the final product made from the bottles, cans and cardboard boxes left at the curbside by hundreds of thousands of residents of Fresno and three surrounding counties. They’ve been sorted and separated by a maze of conveyor belts, fast-moving machines and human pickers, and ultimately binned and baled into the cubes stacked in front of Kalpakoff. He says his transfer station used to move out bales like this within just a few days -- but now hundreds of them are sprinkled throughout the property, in empty corners and unused parking lots. “Right now the market is upset, and it's upside-down for recyclers,” says Kalpakoff. Why? 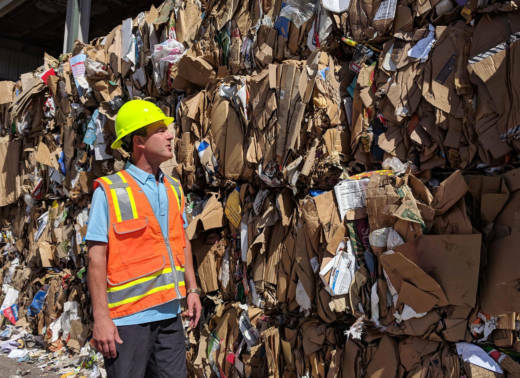 Because a new policy in China leaves huge amounts of the U.S.’s recyclables without a destination. Stockpiling them is one option, but permits limit how many bales can be stacked. If Kalpakoff hits that ceiling, he may have to start sending his recyclables to landfills -- something some other companies have already resorted to. The U.S. prides itself that it recycles about a third of its solid waste. California set an ambitious goal to recycle 75 percent of its waste by 2020. But the U.S. can’t process all that material, so we ship a huge amount overseas. The biggest importer is China, which takes about a third of our scrap materials. But that changed in March, when China cracked down on contamination -- basically unwanted material -- like the plastic bags, hubcaps and flip-flops I watch sorters pull off a conveyor belt. China dropped its acceptable contamination rate dramatically from 7 percent of each bale to just half a percent. The new policy also banned 24 products, mostly paper and plastics. On May 4, China stopped importing all U.S. recycling for 30 days. The Chinese government claims it’s a push for the environment. These policies arose from a program loosely translated as “National Sword,” which aims to cut down on imports of foreign waste. Adina Adler of the Institute of Scrap Recycling Industries says recycling wasn’t the main target, but it became a casualty. She says while the policies themselves aren’t unreasonable, they were made without consulting the recycling industry. 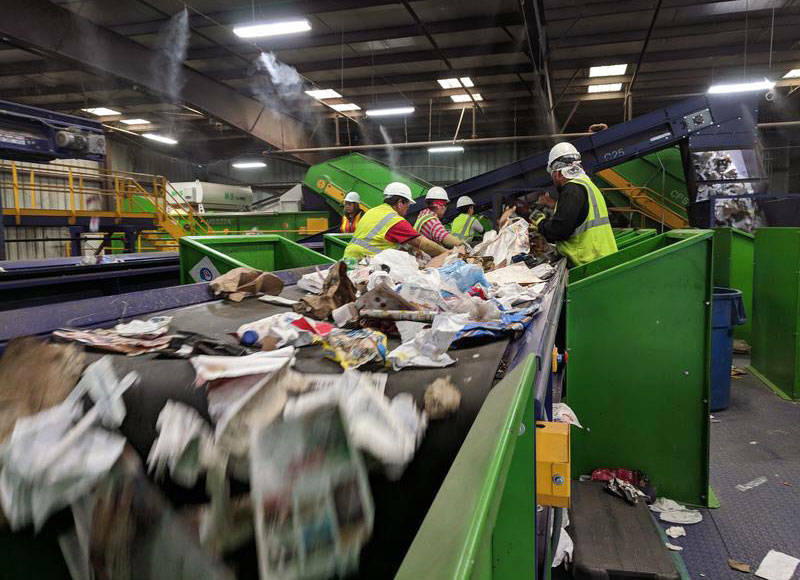 “So they’re done without an understanding of what is the existing recycling technology and how it can produce and to what tolerances,” she says. China’s environmental bent began years ago. But Kate O’Neill, a professor of environmental science and policy at UC Berkeley, says the most recent move (the ban starting on May 4) certainly had suspicious timing. “I think the latest has to do more with the current tensions over trade with the Trump administration,” she says. These policies have consequences beyond just recycling companies. In California, if too many recyclables end up in landfills, entire cities could end up in violation of state laws that require waste to be diverted away from dumps. O’Neill says this is an opportunity to redesign the entire recycling industry. “It means they have to get a lot more creative and really start pushing for better infrastructure at home to recycle a lot of the paper and plastic that we produce,” she says. Some public agencies are already making changes. Bakersfield has proposed increasing recycling fees, in part because of China’s new policies. Starting in June, Fresno will be re-educating residents on what’s recyclable and what’s not. 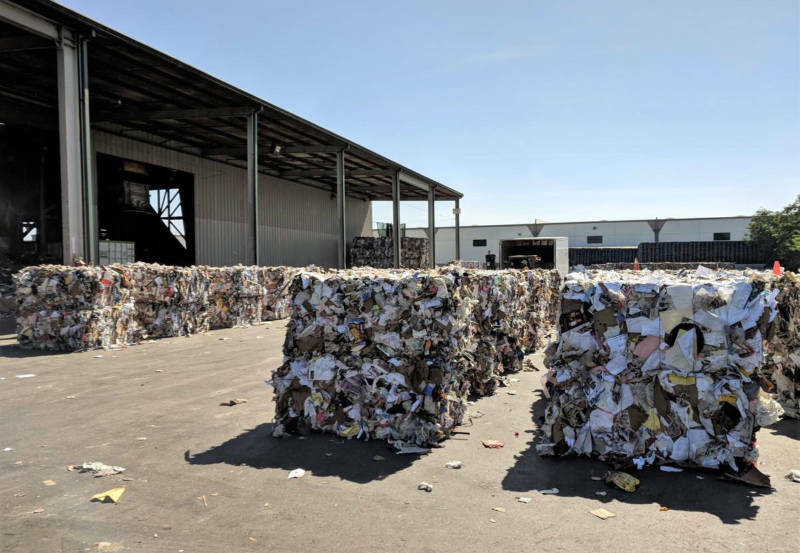 The state agency Cal Recycle is encouraging regulators to loosen restrictions on how many bales recycling companies like Mid Valley can stockpile. None of these, however, are fast enough for Joseph Kalpakoff. He’s worried about the future. But he has at least one idea: He may buy more bird calls to keep the critters out of his growing stockpile.